What coaching course does your club need in 2015? We have coaches standing by ready to help. Just let me know what you need and I will match your club’s need to the coaches available. 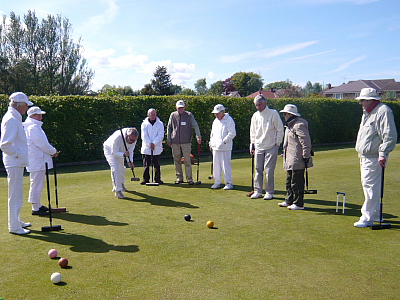 Courses are available in Golf and Association Croquet for all levels from beginners to A-class. Each Flying Circus course is typically 1 day long and caters for 8 – 16 players of a similar ability. Best of all – in the North West, our courses are free to all club members. Coached by Ken Cooper, this ever popular 1- day North-West Federation Bronze Course concentrates on the important parts of the CA’s 2-day Bronze course and covers openings, split croquet strokes, hoop approaches, basic cannons, 4-ball breaks, general strategy against better players, break management, plus blackboard lessons on 3-ball endings (if time permits). The course will be run from 10am- 4pm. Bring your own lunch. This tends to be a very intense day to get everything covered but well worth it in the end. Last year we ran a very successful 2-day course for aspiring coaches at Chester. This year Westmorland has 2 people who want to complete this course so if there are at least 4 others in the area who want to attend this them we can arrange it. Anyone seeking to become Club Coaches, CA grade 1, 2, or 3 Association coaches or CA Golf Croquet coaches may attend. To attend the course you are expected to have a working knowledge of the rules of Association Croquet and/or Golf Croquet. Westmorland have offered to host this, or if another Club is interested then the 2 Westmorland people will travel. Please contact me the Federation Secretary if interested. The second North West Coaching Pod for A and B class players was held at Bowdon on Tuesday 12th August, when 6 of the North West’s finest players from as far afield as Chester and Fylde were treated to a masterclass in the tactics of pegged out end games by former Great Britain player Colin Irwin. The weather was fine so the players were outside from 1830 until after 2000 when everyone had the chance to play 3 or 4 endgames playing as either the 2-ball player or the 1-ball player with 20 minute time limits. Once practice was over players spent a lively hour or more discussing what they had learned from the games. • The two balls have a very strong position IF they have patience and avoid giving things away. • Separating to defend the shot at a ball left near your hoop after a failed hoop approach was a new idea to many. (In normal 4 ball play separating equals giving up the innings so is seen as weak. Separating as a strong play to defend the innings, i.e. prevent the shot and make sure you get the innings back later is almost counter intuitive. • The two balls don’t have to do anything immediately; they don’t have to take risks and can be patient. • The two balls joining deep in a corner a long way from their hoop is not really a good position, especially if they have set a good rush, the single ball can shoot without conceding a break, so manoeuvring to control key areas of the court area is best, for example third corner area if the 2 balls are for 4b. • Look for these areas when making a leave, no free shots. • The single ball needs to be aware of potential squeeze opportunities. It may be better to try a more difficult hoop approach where the fallback position if the hoop cannot be run is a squeeze. • The single ball has to be aggressive, more so that you would be if 4 balls were on the court, if there is an opportunity to get both enemy balls into play you usually have to try it, even if it is a bit difficult. • The good leaves are not so easy to make, you need good control. I know leaves are a separate topic, but there was a bit of discussion on how you set them up, so I just pointed out that in principle you want to make rover off the ball staying in the game, and before you make rover you want the ball to be pegged out and your partner ball both near the peg because you can leave the ball that is staying almost anywhere so you have no pressure to get a rush after rover, makes rover a safer hoop to run, and you need a ball to rush away after you make the peg out. Even the idea that you really should make rover off the enemy backward ball was a revelation to some. • The pegged out game needs a lot of thought and concentration and above all patience. • What you do is influenced by who you are playing against. The overall reaction was very positive; people liked the opportunity to practice the situations in a slightly competitive atmosphere. Obviously people could just get together and practice casually, but they don’t, the pods are an opportunity to practice situations in a more stimulating atmosphere. Several of the players said that they had really disliked pegged out games and would be happier now if that situation arose. Would you like to become a Croquet Coach ? This 2-day course aims to improve your coaching skills and enables you to have the opportunity to be assessed as part of your development as a graded coach. The course will be given by North West Federation Coaching Officer and Grade 2 coach, Christine Irwin. Anyone seeking to become Club Coaches, CA grade 1, 2, or 3 Association coaches or CA Golf Croquet coaches may attend. 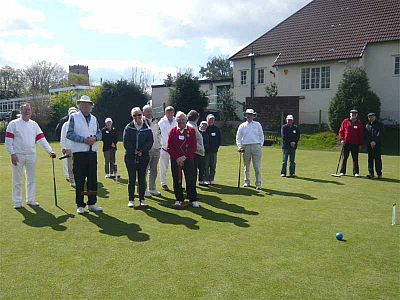 To attend the course you are expected to have a working knowledge of the rules of Association Croquet and/or Golf Croquet.